The following brief video comes from CNN. Thank you to Daniel C. Peterson for bringing it to our attention. In the wake of the terrible attack on the Manchester Arena that resulted in the deaths of 22 people, and injured 119 others, many have come to leave flowers, messages and light candles in memory of those that lost their lives to this act of senseless hatred. Among those that came to remember the victims were Sadiq Patel and Renee Black. Sadiq is Muslim and Renee is Jewish, two groups that are often at serious odds with one another. 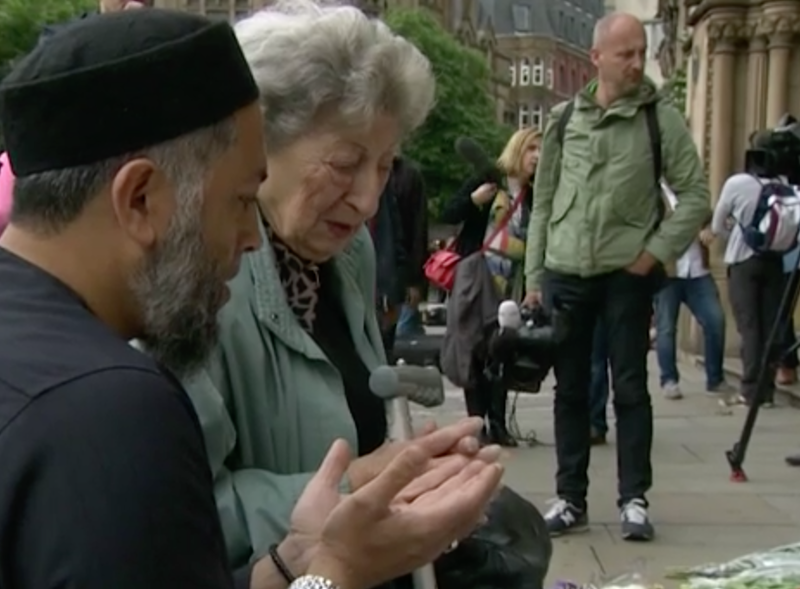 But that didn’t stop the two from traveling to Manchester together and combining their faith to pray for the victims and their families. An attack like this is not how any of us would choose to be brought together, but it’s beautiful to see that we can nonetheless use it as an opportunity to unify in our need for love and our need for divine guidance and comfort, regardless of religious creed. How sad, this act of terrorism, and yet, how beautiful that these two people can come together to pray and console each other, and inadvertently, the world. We are all brothers and sisters regardless of where we live and how we believe. This compassion is how it should be.